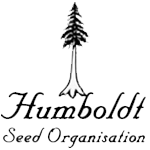 Humboldt Seed Organisation - Black D.O.G.. Free US delivery. Humboldt Seed Organisation - Black D.O.G. Black D.O.G. 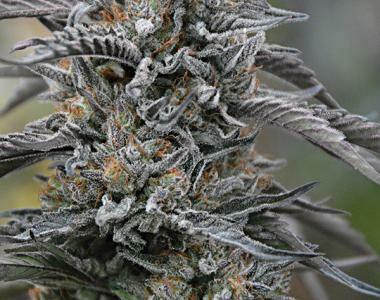 is an F1 hybrid created by crossing Blackberry Kush with Emerald Headband. It is a potent 85% indica strain that is very easy to grow and has very high outdoor yield potential. The vegetative and root growth is quite explosive making it possible to move into the flowering phase in double quick time. Although the fan leaves are broad the inter-nodal distance is wide enough to allow for good light penetration and a more even structural development. Expect the stretch to be around 30% during flowering which takes between 48 and 55 days. In the fifth week large crown buds appear producing a high level of oils and resin. The perfume is strongly reminiscent of berry and grape. Indoor yields are between 350 - 400 gr/m2 in a flowering time of 7 - 8 weeks. In outdoor environments Black D.O.G. can reach over 3 meters tall and is ready to be harvested at the end of September or the beginning of October in northern latitudes. Yields are anywhere between 1 and 3 kilos of dried weight per plant. THC production is between 16% - 21% depending on conditions and grower expertise. Predominant aromas and flavours of berries, grapes and diesel. This strain is highly recommended for the relief of pain, migraines and as an appetite stimulant and it has qualities that are cerebral as well as developing into a couch-lock finish which can make for a very pleasant, relaxing experience.